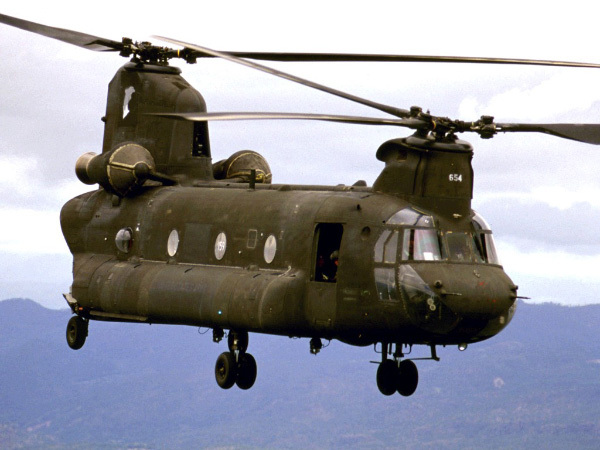 The Boeing/Vertol CH-47 Chinook is a versatile, twin-engine, tandem rotor heavy-lift helicopter. Its top speed of 170 knots (196 mph, 315 km/h) was faster than utility and attack helicopters of the 1960s and even many of today. Its primary roles include troop movement, artillery emplacement and battlefield resupply. It has a wide loading ramp at the rear of the fuselage and three external-cargo hooks. The Chinook was designed and initially produced by Boeing Vertol in the early 1960s. The helicopter is now produced by Boeing Integrated Defense Systems. Chinooks have been sold to 16 nations.